Objectives Patients with clinical, genetic and histological features of coeliac disease (CD), but negative for serological markers, pose a significant clinical problem. The aim of this study was to outline a specific profile, and to evaluate the natural history and response to gluten-free diet (GFD) of patients with seronegative CD. Methods patients with duodenal mucosa damage Marsh I, II and III stages, HLA DQ2/DQ8 haplotype and clinical features suggestive of CD, but negative for CD serology, were defined as seronegative CD patients. Other common causes of duodenal mucosa damage were excluded. HLA–DR and DQ genotype/haplotype between all Marsh stages of patients with seronegative and seropositive CD were compared. Clinical features, laboratory testing and histological findings were evaluated after a GFD and a gluten rechallenge. A long follow-up period was available. Results 48 patients fulfilled diagnostic criteria over a 4-year period. Clinical phenotype and HLA−DR and DQ frequencies between patients with seronegative and seropositive CD was similar. However, Marsh I stage was more prevalent in seronegative patients (42% vs 22%; p<0.05). After a 1-year GFD trial, clinical symptoms, histological features and laboratory testing improved in 40 patients and worsened in those who underwent a 6-months gluten challenge. Five patients with seronegative CD (25%) experienced the occurrence of autoimmune diseases during a median follow-up of 133 months (range 72–192). Conclusions Patients with seronegative CD did not display a specific profile. They benefitted from GFD as patients with seropositive CD. Waiting for more sensitive serological markers, the diagnosis of seronegative CD remains a diagnosis of exclusion. ▸ Seronegative coeliac disease occurs in a small proportion of patients. ▸ The diagnosis and treatment of patients with seronegative coeliac disease pose a clinical problem. ▸ In patients with seronegative coeliac disease, homozygosity for HLA–DQ-B1*02 genotype is less frequent compared with patients with seropositive coeliac disease. ▸ Clinical, histological and laboratory parameters improved in patients with seronegative coeliac disease following a gluten-free diet trial. ▸ Natural history of patients with seronegative coeliac disease is similar to patients with seropositive coeliac disease. ▸ Waiting for more sensitive serological markers, the diagnosis of seronegative coeliac disease remains a diagnosis of exclusion. ▸ A long-term gluten-free diet is still the best treatment option in patients with seronegative coeliac disease. The first approach to diagnose CD is non-invasive.6 ,7 The preferred test is based on serology while patients are on a free diet. IgA anti-tissue transglutaminase (TTG) antibody is the most recommended test given its high accuracy. In patients with increased risk to develop CD, IgG-deamidated gliadin peptides (DGPs) may also be tested. Baseline IgA endomysial antibody (EMA) should be assessed in patients on a gluten-free diet (GFD).7 Patients with positive serologic tests should undergo an upper endoscopy with small-bowel biopsy to confirm the diagnosis of CD. The diagnosis is presumptively established when there is concordance between the serologic and the biopsy findings. However, it is definitely confirmed when symptoms improve following gluten avoidance.8 Demonstration of histological normalisation is not always required. In clinical practice, there are occasionally individuals with negative serologic tests despite the presence of features suggesting CD. These patients should be tested for HLA-DQ2 (DQA1*05; DQB1*02) and/or DQ8 (DQA1*03; DQB1*0302) haplotypes because CD is highly unlikely to occur in patients lacking these haplotypes.9 In positive patients, small-bowel biopsies are needed to confirm the diagnosis. Histologic findings in the duodenal mucosa are usually described using the Marsh-Oberhuber classifications.10 ,11 They may be characterised by solely a mild increase of intraepithelial lymphocytes (IEL), or enhanced apoptosis and crypt hyperplasia, up to a complete loss of villi and total mucosal atrophy.10 ,11 However, lymphocytic infiltration of the intestinal epithelium and villous atrophy are not specific for CD and may be present in a variety of other disorders such as small-intestinal bacterial overgrowth, Crohn disease, giardiasis and a number of other less frequent causes.12 Demonstration of histological and laboratory tests improvement and/or normalisation is always required after 6–24 months of a GFD, because a subgroup of patients with irritable bowel syndrome may have symptomatic benefit from a GFD.13 Owing to this phenomenon, some authorities recommend to repeat duodenal biopsy after a gluten rechallenge, although this approach remains uncertain, and more importantly, quite unpleasant for patients. In this study, patients with different Marsh stages with clinical, histological and genetic features suggestive of CD but negative for serological markers were investigated and compared with patients with seropositive CD. In addition, natural history and response to a GFD and gluten rechallenge were evaluated. This was a prospective cohort study. In the first step, patients with a ‘presumptive’ diagnosis of CD based on clinical features, HLA-DQ2 and/ DQ8 alleles and small-intestine histology, but negative for serology were enrolled in the study. Although the major Gastroenterological Societies2 define seronegative CD patients as those with villus atrophy, in order to make easier for readers, in our study the definition of ‘seronegative’ CD also included patients with Marsh I and II stages. Phenotype and HLA–DR and DQ haplotypes of patients with seronegative CD were compared with patients with seropositive CD. Seronegative patients were invited to undergo a GFD for 12 months followed by a second endoscopy with duodenal biopsy, laboratory testing and clinical assessment. In the third step, patients with seronegative CD were checked by an additional duodenal biopsy at the end of a full gluten challenge. A follow-up of patients with seronegative CD was also available. Patients with CD on the basis of clinical features, proximal small-intestinal biopsies compatible with CD according to Marsh classification and positive for HLA-DQ2 and/or DQ8 alleles but negative for serology markers were enrolled in the study. Written informed consent was obtained from each patient. The protocol was approved by the local ethics committee, Azienda Unità Sanitaria Locale N 1, Sassari, Italy. Patients with Helicobacter pylori infection, ova and parasites such as giardiasis and/or other intestinal infections in the stool, Crohn disease, small-intestinal bacterial overgrowth, drug-induced enteropathy and established diseases including liver and pancreas disease or cancer, and eosinophilic infiltrate in duodenal specimens were excluded from the study. Patients with a new diagnosis of seropositive CD were evaluated in the same fashion as that of patients with seronegative CD. Clinical features, laboratory testing and genotyping were compared between patients with seropositive and seronegative CD. Laboratory tests: complete blood count, erythrocyte sedimentation rate, C reactive protein, protein electrophoresis, B12 vitamin and folic acid levels, ferritin, iron, calcium, thyroid hormones, serum immunoglobulins, albumin, triglyceride, cholesterol, liver and pancreas function tests and glycaemic levels. Stool samples were examined for ova, bacteria and parasites. Serology markers for CD: IgA and IgG antibodies for native gliadin (AGA), EMA and TTG. Breath tests (BTs): the presence of H. pylori infection was confirmed by 13C-urea BT (UBT). Lactose malabsorption and small-intestinal bacterial overgrowth were assessed by conventional hydrogen BT. Endoscopy: each patient underwent upper endoscopy. Tissue specimens were taken from the antrum, angulus, and from the corpus of the stomach. Three additional biopsies were obtained from the duodenum. Antibody testing was based on the identification of IgA and IgG TTG antibodies by a validated, standardised and reliable commercial kit (Eurospital, Trieste, Italy). IgA and IgG AGA antibodies were assessed by the immunocup system (Pharmacia & Upjohn Diagnostic, Uppsala, Sweden) and IgA EMA antibodies were detected by indirect immunofluorescence on monkey oesophagus (ALPHADIA sa/nv, Diagnostic Products, Wavre, Belgium). Mucosal sections were evaluated by two expert gastrointestinal pathologists (VV and AM) independently. In the case of CD histologic features, the Marsh classification was applied. Briefly, a Marsh I stage corresponded to a cut-off of >25 IEL per 100 enterocytes, increased IEL associated with crypt hyperplasia was classified as Marsh II, and partial, subtotal or total villi atrophy as Marsh IIIa, IIIb and IIIc, respectively. The presence of CD3 lymphocytes was also confirmed by immunostaining. The presence of HLA-DQ2/DQ8 was assessed by an ELISA commercial kit (Eurospital, Trieste, Italy). Mann-Whitney U test was used to compare the age of seronegative versus seropositive CD patients at diagnosis, as well as the other continuous variables. Pearson χ2 test was used to compare the categorical variables between the patient subgroups. For histological analysis, the Marsh IIIa, IIIb and IIIc categories were merged together.18 Similarly, the presence of osteoporosis and osteopenia was recoded into a single category. The association of the Class II HLA–DR-DQ haplotypes with CD was assessed with data points arranged in contingency tables and assessed by the Fisher's exact test. Haplotypes were grouped for DQ2 according to their association with DR3 haplotype or with DR5/DR7 haplotypes. DQ8, encoded by DQB1*0302 allele, is generally associated to DR4 haplotype. All tests were performed as two-tailed and differences were considered statistically significant when p<0.05. Statistical analysis was carried out using SPSS V.16.0 software (SPSS Institute, Illinois, USA). A total of 48 patients with a median age of 36 years; range 16–76, were included in the study (40 female patients; F/M 5:1). All cases were negative for CD serology markers (except four for AGA IgG and one for AGA IgA) and positive for histological alterations in the small-intestinal mucosa according to Marsh classification, CD3 immunostaining and HLA DQ2/DQ8 alleles. Patients were tested for bone mineral density and invited to undergo a GFD for 12 months (figure 1). Flow diagram of the patients with seronegative coeliac disease prospectively studied according to each step. Clinical features of patients with seronegative CD are shown in table 1. Abdominal pain lasting for at least 1 year, in the majority of cases associated with abdominal bloating, was the most common symptom (44/48; 92%). Laboratory tests were altered in most patients (table 1). Notably, low IgA levels were not detected in any patient. A high proportion of patients (63%) displayed lactose malabsorption; however, it was not considered to be the sole cause of intestinal injury. Autoimmune disorders were associated with seronegative CD only in few cases (type I diabetes in one patient, Hashimoto's thyroiditis in five patients). In six patients, a non-herpetiformis dermatitis was observed. Use of angiotensin II inhibitors, nowadays known to be harmful for intestinal mucosa,16 was not recorded in any of the 48 studied patients with the exception of one 67-year-old female patient, who was taking enalapril. According to the Marsh classification, the most observed lesion in the duodenal mucosa of patients with seronegative CD was Marsh I (20/48; 42%). Surprisingly, 15 patients displayed Marsh III (table 1). Patients with seronegative CD were compared with 85 patients with seropositive CD (table 1). Median age and gender ratio (F/M 5:1 vs F/M 4:1) between the two CD groups were similar. Reported abdominal symptoms were more frequent in seronegative CD (92% vs 76%, p=0.029), whereas family history of CD was more frequent among patients with seropositive CD (37% vs 17%, p=0.011). Overall, patients with seronegative CD did not display a specific laboratory profile, moreover alterations of biochemical tests were, in general, less common than in patients with seropositive CD. In addition, severe duodenal mucosal damage (Marsh II–III) was observed less frequently in patients with seronegative CD compared with patients with seropositive CD (58% vs 78%, p=0.019) (table 1). This may explain the lower frequency of lactose malabsorption in patients with seronegative CD compared with patients with seropositive CD (63% vs 91%, p=0.0001). Autoimmune diseases such as diabetes type 1 and Hashimoto's thyroiditis and an established mild anxiety-depression syndrome as well as non-herpetiformis dermatitis were more often associated with patients with seronegative CD. Instead, osteopenia and/or osteoporosis were more frequent in patients with seronegative CD than in patients with seropositive CD. Additional analyses were performed in order to compare Marsh II and III stages of seronegative CD patients with seropositive CD patients (see online supplementary material). Class II HLA haplotypes were assessed in 32 patients with seronegative CD and in 62 patients with seropositive CD. Findings were also compared with the Sardinian general population.17 The frequency of HLA–DR and DQ haplotypes is presented in table 2. As expected, almost half of seropositive patients were homozygous for HLA-DR3-DQB1*02 and HLA-DR4-DQB1*0302 haplotypes which are strongly predisposing for CD. On the contrary, among seronegative patients, the frequency did not differ significantly from that of the general population. Moreover, the frequency of homozygotes DQB1*02, usually associated with a more severe disease, was twofold higher in patients with seropositive CD (38.1% vs 15.2%) compared with seronegative CD (data not shown). Notably, none of the seronegative patients was negative for alleles predisposing to CD. After 1 year of GFD, patients were interviewed for diet compliance and symptoms. A straight adherence to GFD was recorded for 44 patients (92%). Four patients reported difficulties to completely adhere to the GFD. All patients were invited to repeat the esophago–gastro–duodenoscopy (EGDS) with duodenal biopsy and laboratory testing (figure 1). Among the 48, 40 patients agreed, 34 were females; median age 36 years (range 22–69) (table 1). There was a dramatic improvement of abdominal symptoms that was statistically significant among patients with seronegative CD that completely adhere to GFD. In addition, haemoglobin levels gained normalisation in all five patients and folate was in the reference range in six patients out of seven (86%) (table 1). More interesting, Marsh III mucosal duodenal injury resolved in 14 patients out of 15 (93%), out of 40 undergoing EGDS, and a complete restitutio ad integrum was observed in 13 patients (table 1). Bone mineral density significantly increased in the lumbar spine and femoral neck compared with previous examination (table 1). 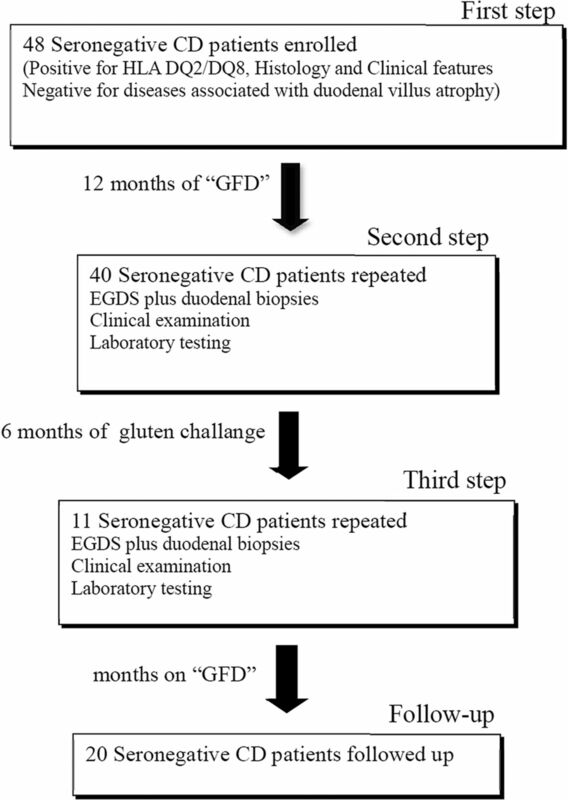 Patients with seronegative CD on GFD for up to 12 months and re-evaluated for duodenal mucosa features were invited to undergo a gluten challenge (figure 1). Among 40 patients, 19 agreed to follow a gluten-rich diet trial. However, eight patients avoided food containing gluten after few weeks because of the occurrence of abdominal symptoms. All 11 patients underwent a third EGDS with duodenal biopsies after 6 months of free diet. Examination of duodenal specimens according to Marsh classification showed no patient with Marsh 0, three patients with Marsh I, eight patients with Marsh II and no one with Marsh 3, respectively (table 3). All patients reported recurrence of gastrointestinal symptoms. Twenty patients were available for the follow-up after a median of 133 months (range 72–192 months) (table 4). The majority (90%) were female patients. Three of them developed autoimmune thyroiditis, and inflammatory bowel disease, ulcerative colitis and Crohn disease, respectively, occurred in two patients. The newer DGP assay is also highly sensitive and specific for CD and has been shown to detect patients who were seronegative by TTG testing;27 ,28 however, at the time of patient enrolment antibodies to DGP were not yet available. In addition, it has been reported that CD markers may be negative in the presence of partial villus atrophy such as in subclinical or silent CD.29 This could justify negative CD markers in the 20 patients with mild intestinal mucosa damage (Marsh I), but is inexplicable for the 28 patients with Marsh II and III. We may also cautiously suppose that in seronegative CD patients autoantibodies might have disappeared in adulthood, similarly to other autoimmune diseases such as type 1 diabetes.30 An additional issue may be that until 2012, the antihypertensive drug olmesartan was not recognised as a potential factor of severe villus atrophy;16 however, in our cohort of young patients, hypertension was not recorded among comorbidities except for one 47-year-old woman taking enalapril. The existence of seronegative CD was previously reported in several studies,31–35 although its prevalence is still a matter of debate and available information on the clinical phenotype of this subset of patients with CD is currently discordant. For example, Rostami et al31 reported a high prevalence of seronegative CD in 1999. In this study, patients had mild intestinal alterations and moderate gastrointestinal symptoms. Abrams and colleagues reported a prevalence of patients negative for all CD-related serological tests in 15% of their patients with villus atrophy.32 The most striking finding of their study was that clinical features and associated disease in patients with seronegative CD were similar to those with seropositive CD and improved following a GFD.32 In contrast, in a more recent study of adult patients with seronegative CD, on the basis of negative TTG, DGP and EMA tests, positive genetic tests and histological findings consistent with a diagnosis of CD, only two patients out of eight showed an initial improvement of symptoms after a GFD.34 In our study, the majority of seronegative patients experienced a reduction of symptoms on GFD. The long-lasting effect of GFD observed in our cohort on gastrointestinal symptoms tend to exclude a mere placebo effect.13 In patients with malabsorption, duodenal biopsy is needed in order to analyse the intestinal mucosa for villus atrophy.32 Although malabsorption was not detected in the 100% of our patients with seronegative CD, all had some degree of mucosal duodenal injury and, more importantly, symptoms improvement was associated with normalisation of duodenal mucosa. Overall, differences in clinical phenotype and genotype between patients with seronegative and seropositive CD were minimal, insufficient to draw a specific profile. However, the frequency of DRB1*02 homozygosis, which entails a more severe underlying autoimmune process, was significantly reduced in seronegative patients, a possible indication that patients with seronegative CD have a relatively milder genetic profile. There are limitations of our study. First of all, the long follow-up period and the invasive procedures in the different steps of the study determined a high number of dropouts. Moreover, patients were seen by different physicians over a 13-year follow-up period and some loss of data cannot be ruled out. Finally, a gluten challenge test was refused by several patients and for those who agreed, we were not able to guarantee for an adequate introduction of gluten per day. Our study identified a subgroup of patients with clinical and genetic features associated with histological lesions peculiar of CD and negative serology that benefits from GFD. We failed to trace a specific phenotype and/or genotype in our cohort of patients with seronegative CD compared with patients with seropositive CD. Waiting for more sensitive serological markers, small-bowel biopsy remains the ‘gold standard’ for the diagnosis of gluten intolerance in patients with malabsorption and unexplained abdominal symptoms. A strict, lifelong gluten avoidance appears the most reasonable treatment for these patients. American Gastroenterological Association Medical Position Statement: Celiac Sprue. Gastroenterology 2001;120:1522–5.
. Celiac disease. A gastrointestinal disease with environmental, genetic, and immunologic components. Gastroenterol Clin North Am 1992;21:405–25.
. The history and geography of human genes. Princeton: Princeton University Press, 1994.
. Role of routine small intestinal biopsy in adult patient with irritable bowel syndrome-like symptoms. Minerva Med 2010;10:129–34.
. Mucosal histopathology in celiac disease: a rebuttal of Oberhuber's sub-division of Marsh III. Gastroenterol Hepatol Bed Bench 2015;8:99–109.
. Seronegative celiac disease: where is the specific setting? Gastroenterol Hepatol Bed Bench. 2015;8:110–6.
. Testing for IgG class antibodies in celiac disease patients with selective IgA deficiency. A comparison of the diagnostic accuracy of 9 IgG anti-tissue transglutaminase, 1 IgG anti-gliadin and 1 IgG anti-deaminated gliadin peptide antibody assays. Clin Chim Acta 2007;382:95–9.
. UKPDS 25: autoantibodies to islet-cell cytoplasm and glutamic acid decarboxylase for prediction of insulin requirement in type 2 diabetes. UK Prospective Diabetes Study Group. Lancet 1997;350:1288–93. Contributors MPD, GMP and GR were involved in acquisition of data, analysis and interpretation of data, drafting of the manuscript, study concept and design, and critical revision of the manuscript for important intellectual content. ID contributed to acquisition of data. VV and AM carried out analysis of biopsies and critically revised the manuscript for important intellectual content. Ethics approval The protocol was approved by the local ethics committee, Azienda Unità Sanitaria Locale N 1, Sassari, Italy.